Fragment of a carved relief featuring three horses drawing a chariot. From the north-west palace, Nimrud, Assyria (modern-day Iraq). Neo-Assyrian, 9th century BC. Rarely seen equine treasure’s from the Queen’s collection will form part of a free horse exhibition at the British Museum. The exhibition, part of events marking the Queen’s Diamond Jubilee year, will run from May 24 to September 30. The Queen has agreed to be patron of the exhibition. “The horse: from Arabia to Royal Ascot” will include a rarely seen painting by renowned equine artist George Stubbs. The 1793 work depicts Laetitia, Lady Lade, the wife of Sir John Lade, who was then racing manager to the Prince of Wales, later to become George IV. It normally hangs in the private rooms at Windsor. It will also be a chance to view The Godolphin Arabian, by Thomas Butler, which was painted between 1750 and 1755. The work normally hangs in private rooms at the Royal Mews. The Queen is also loaning a silver Fabergé sculpture of Persimmon, a racehorse owned by Edward VII, which won the 1896 Doncaster St Leger and Epsom Derby. Other important loan items will come from the British Library, the Fitzwilliam Museum and the Royal Armouries, as well as rare material from Saudi Arabia. They will be seen alongside objects from the British Museum’s own collection, including famous pieces such as the Standard of Ur and Achaemenid Persian reliefs. The museum points out that the history of the horse is the history of civilisation itself. The horse has had a revolutionary impact on ancient civilisations and the exhibition explores the influence of horses in Middle Eastern history, from their domestication around 3500BC to the present day. 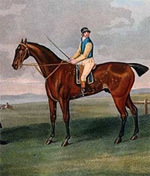 Britain’s long equestrian tradition is examined from the introduction of the Arabian breed in the 18th century to present-day sporting events such as Royal Ascot and the Olympic Games. The domestication of the horse more than 5000 years ago dramatically changed human history. Domestication is thought to have first happened on the steppes of South Russia, with horses being introduced into the Middle East around 2300BC. Before this introduction, asses and donkeys were used for transport, predominantly as harness animals pulling cumbersome but technologically advanced vehicles, as seen on objects found at the Royal Cemetery of Ur. Gradually, horses became the means of faster transportation for these early societies. The exhibition includes one of the earliest known depictions of a horse and rider: a terracotta mould found in Mesopotamia (Iraq) dating to around 2000BC to 1800BC. Horses became a vital component in warfare and hunting, as reflected in the art of ancient Assyria, where elaborate and ornate horse trappings and ornaments were developed reflecting the prestige and status of horse, charioteer and rider. Riding became an essential part of society during the Achaemenid period (5th to 4th century BC). A cylinder seal of Darius, dating to 522BC to 486BC, shows the king hunting lions in a chariot, and famously, the Achaemenid’s introduced “post horses”, which were used to deliver messages on the royal road. The horsemen of the Parthian Empire (3rd century BC – 3rd century AD) were celebrated by Roman authors for the “Parthian shot”, in which an apparently retreating rider would shoot arrows backwards whilst on horseback. The renown of Parthian horsemen is shown in their representation on terracotta plaques and bronze belt buckles in the British Museum collection. Arabic, Persian, Turkish and Mughal miniature paintings, ceramics and manuscripts all attest to the growing importance of the horse in the Islamic world from the 7th century AD. Exquisite Mughal miniatures depict princes with their valued Middle Eastern steeds, horses that were famed for their speed and spirit. A magnificent Furusiyya manuscript, dating to the 14th century AD, on loan from the British Library, is a beautifully illustrated manual of horsemanship, including information on proper care for the horse, advanced riding techniques, expert weapon handling, manoeuvres and elaborate parade formations. The horse has a long history on the Arabian Peninsula, becoming an important cultural phenomenon and a noted part of the traditional Bedouin way of life. The Arabian horse was developed through selective breeding, and with features including a distinctive head profile and high tail carriage, the Arabian is now one of the most familiar horse breeds in the world. The exhibition includes detailed panorama photography of rock art which show horses in scenes of various dates from sites in Saudi Arabia, as well as loans of objects from Qaryat al-Fau, which include wall paintings and figurines. The importance of fine horses in the Middle East is explored through the fascinating Abbas Pasha manuscript, dating to the 19th century and on loan from the King Abdulaziz Public Library, Riadyh. This document is the primary source of information about the lineage of the purebred Arabian horses acquired by Abbas Pasha (the viceroy of Egypt) throughout the Middle East. The story of the Arabian breed of horse is examined in parallel to that of Wilfrid Scawan Blunt (1840-1922), poet and agitator, and Lady Anne Blunt (1837-1917), the granddaughter of Lord Byron. The Blunts travelled widely in the Middle East and established a celebrated stud for purebred Arabians, which was crucial for the survival of the Arabian breed, at Crabbet Park in Sussex, and another outside Cairo in Egypt. Horses, including Arabians, had long been imported from the Middle East to Britain, but from the 17th century, three Arabian stallions in particular were introduced, which, bred with native mares, produced the thoroughbred breed. Paintings and prints, trophies and memorabilia explore their remarkable success and their influence on sport and society, from early race meetings through to modern equestrian events. The exhibition is supported by the Board of Trustees of the Saudi Equestrian Fund, the Layan Cultural Foundation and Juddmonte Farms, in association with the Saudi Commission for Tourism & Antiquities. The Minister of Education and chairman of the board of trustees of the Saudi Equestrian Fund, Faissal Ibn Abdullah Ibn Muhammad Al-Saud, said: “It is well known that the horse has played a crucial role in the development of civilization, and that a close bond exists between horses and men. Just to let you know that Peter Upton’s THE ARAB HORSE will be on sale at the British Museum – it’s launch coincides with the opening of the exhibition The Horse from Arabia to Royal Ascot! The British Museum will also be selling prints and postcards of Turfa taken from the book.